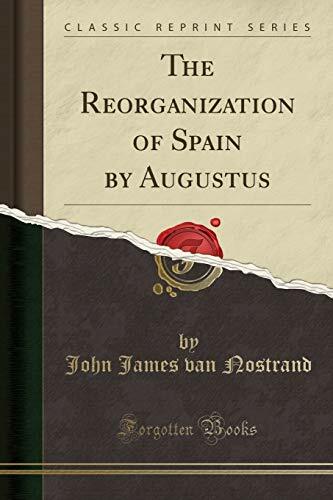 Excerpt from The Reorganization of Spain by Augustus<br /><br />The civil administration of Spain before the time of Augustus has not been the subject of any connected account. Some details of Republican rule have been given a place in the pages of the historians of antiquity; others may be assumed from the fact that they were common to all the provinces. But it should be' remembered that Spain was the governmental experiment sta tion of the Romans.9 Therefore it is not unreasonable to sup pose that many early schemes were given a trial in Spain, failed, and were soon forgotten. Of the plans which succeeded, there remains enough to construct the following account.<br /><br />About the Publisher<br /><br />Forgotten Books publishes hundreds of thousands of rare and classic books. Find more at www.forgottenbooks.com<br /><br />This book is a reproduction of an important historical work. Forgotten Books uses state-of-the-art technology to digitally reconstruct the work, preserving the original format whilst repairing imperfections present in the aged copy. In rare cases, an imperfection in the original, such as a blemish or missing page, may be replicated in our edition. We do, however, repair the vast majority of imperfections successfully; any imperfections that remain are intentionally left to preserve the state of such historical works.